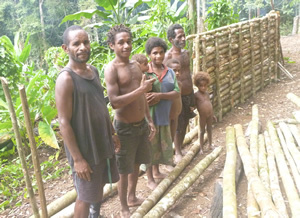 Up until 2015, we ministered in Numba, PNG. It is a remote village, on a mountain, surrounded by jungle, where the locals live in stick huts without electricity or running water. Jim and Jaki Parlier came as missionaries to Numba in the 1960s - when cannabalism was still widespread. They evangelised, established a church, and translated the New Testament into the local Ese language. When they retired about 2000, they established the Ese Bible Institute, to provide ongoing training to local church leaders. 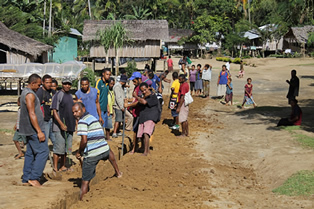 Since then, EBI has had a huge impact, attracting students from every part of Oro Province, and sending out pastors and missionaries throughout PNG. 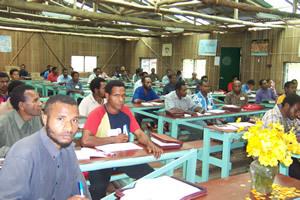 One of the early classes at Ese Bible Institute. Winston, one of the past graduates, has been serving as a missionary for ten years in Musa and Abau, about 100km - or 7 days' walk over mountains and rivers - from Numba. One day, after I had dismissed the Bible College students, Winston picked up a guitar, and started singing. He didn't realise I was filming. The song is a mission song, telling how we must go out in obedience to the Great Commission. Other graduates have gone out to help Winston in the ministry at Safia. They sacrifice a lot, often being away from their families, homes and gardens (food supply). This is Greg. He took his family to Safia to serve on the mission field for three months, enduring difficulties in a place with no roads, schools or medical facilities. 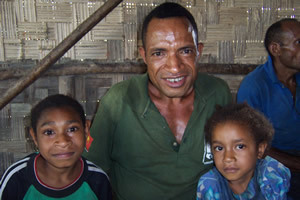 All of his family caught malaria while they were in Safia, and had to suffer without medicines or medical assistance. Greg and his friends have returned to Safia many times for short-term missions trips. Taylor, another past graduate, has been very active in youth ministry in surrounding villages. 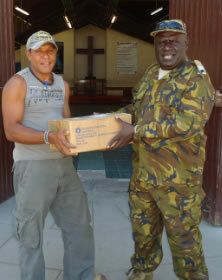 He goes to Moresby regularly to present Bible conferences to the military and police. In the past year, he has also been actively involved in ministry with SIL at their mission base at Ukarumpa in the highlands. 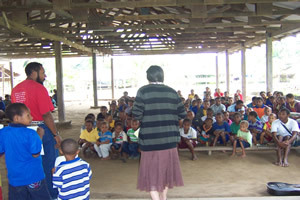 We had opportunity to evangelise the Puwe Gave Ministries - a cargo cult with up to 50,000 members. We believe some of the leaders - including a 'teaching elder' (Oswald), a youth leader (Ladia) and two main Sunday School teachers (Cecil and Miriam) - have been saved. Pray for them as they have opportunities to minister in the cult. and teaching/helping the women of Numba how to sew. A group of women sew and sell clothes to raise money for an Christian orphanage in India. A great lesson how people living in relative poverty can still reach out to help those in greater need! One of the village boys enjoying pictures of the "outside world". 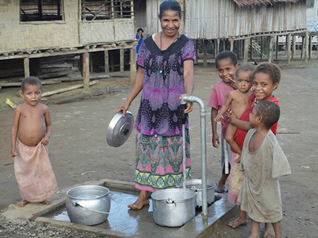 to bring water to taps near the homes in Numba Village. 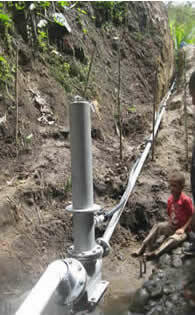 The women and children no longer have to walk down a steep slope to get water from the river below! Praise God! By the grace - and miraculous working - of God, the project only took 8 days to complete! In addition, we sent in a 40 foot sea container filled with a 4WD vehicle (which we used to transport all the pipeline materials into the village), clothes, Bibles and Christian books. 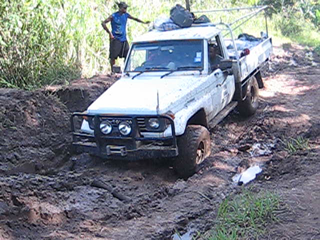 Thanks to Craig and Jack, who literally risked their lives, driving through extraordinarily dangerous conditions, to bring the materials into the village on time. For effective missionary service, especially in Musa and Abau. For continued training through Ese Bible Institute. The water supply It was a mammoth task, but God was faithful - often at the last minute - to provide everything required for the project to be completed ... in an amazing 8 days!